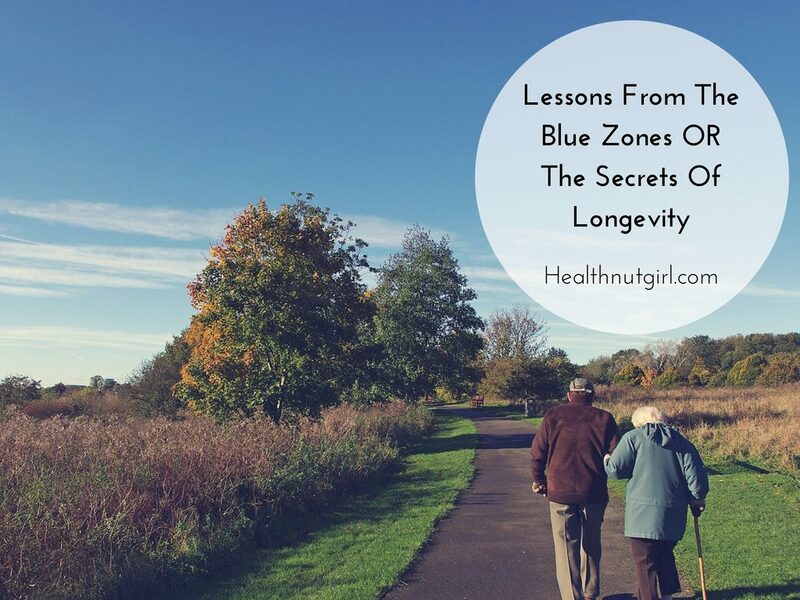 You probably heard me talk about the blue zones but just in case you haven’t, the blue zones are 5 places on our planet where large percentage of the population live well into their 90s and 100s in excellent health. These centenarians are alert, independent, active and free of the debilitating diseases and illnesses that we associate with getting older. 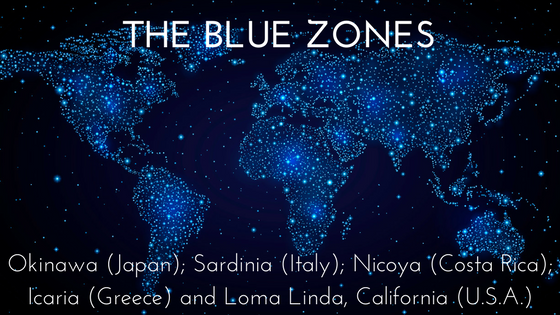 The blue zones are in Okinawa – Japan, Sardinia – Italy, Nicoya – Costa Rica, Icaria – Greece and Loma Linda – California USA. Books have been written. Shows have been produced. Doctors and scientists have been doing research to try and learn their secrets. What are they doing and how can we learn from them and apply their wisdom to our own lives? The good news is that you don’t have to uproot yourself and move into a blue zone. Here are the main 3 things they all have in common and simple steps to implement them into your lifestyle. People in each blue zone eat local and natural food. They don’t avoid wheat or animal proteins or alcohol or many of the foods that so many health experts and diet books say are the source of all health problems. But they do not buy processed and refined foods either or at least use it to a minimum. Most of their food is locally grown, fresh and whole. Many of them garden and grow some of their own produce. They bake their own bread, It’s not hard see my recipes for Spelt Bread, Chickpea Bread and Almond-Coconut Bread. They cook their meals from scratch. In fact meal preparation is an enjoyable and integral part of their day, it is not a dreaded chore. • Fill your plate with fruits and vegetables. • If you have a yard or a sunny window grow some herbs and veggies. • Eat smaller portions of animal proteins. • Minimize as much as possible foods that come in a box or a bag i.e. processed and refined foods. • Snack on sliced veggies, fruits and nuts. Most people in the blue zones don’t go to the gym, they just live an active life style. They walk, they garden, they clean, they cook, they dance, they don’t sit all day or stare at a screen all day. Being active is a built in life-style. In Loma Linda CA many people work out with treadmills and free weights. In Okinawa Japan many people fish. In Icaria Greece many people have a garden and spend time working there every day. The main thing is that they get up and move. • For every hour that you sit, get up and move for 5-10 minutes. • Take a daily long walk of at least 30 minutes. • Take a dance break a couple of times a day, just play a favorite song and boogie in your living room. • Take short walks often by using your car or public transportation less, parking further or getting off one stop earlier. • Take a fun exercise class! Choose an activity you love and enjoy like swimming or yoga or dancing. Researchers agree that the most impactful aspect of longevity is being close and connected to a supportive community. Many of the people in the blue zones didn’t have an easy life and don’t live in a stress free environment. They lived through wars, loss and tragedies, but they are surrounded by a community that supports them. Women in Okinawa, Japan meet regularly in Moais, social groups where they talk about their lives and share their joys and struggles with each other. In Italy, the older generation lives with or nearby extended family, they are never isolated or alone. In every blue zone people are close to their community and spend time with family or neighbors every day; they cook together, they play chess, they share meals, they talk, they laugh, they feel loved and cared for. • Check your local community center for activities that might interest you. • Join a group that meets regularly for a common activity like knitting or a book club. • Become the person in your family that organizes frequent get togethers. • Get to know your neighbors, invite them in for coffee or a meal. • Join the Women Health Circle to be part of a community of women with a common goal: living a healthy, joyful and long life. 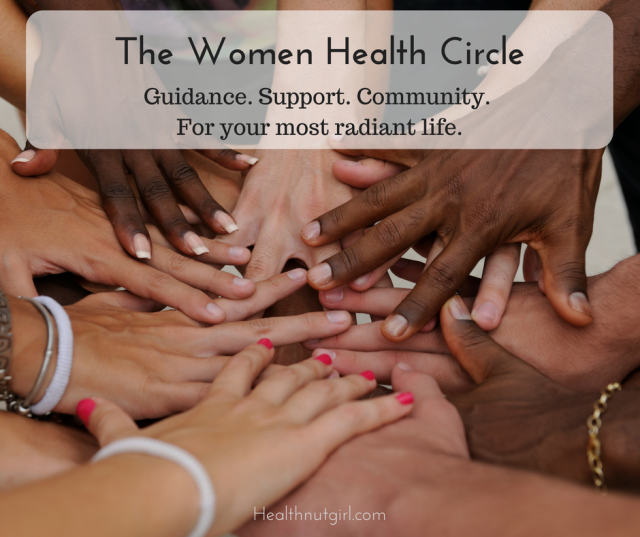 The Women Health Circle is a community of like minded women who meets twice a month online to achieve their health goals and support one another. Check it out and register HERE. Appreciating that we both wrote blog posts this week about aging and how to create and sustain longevity, Rachel. As always, I learn so much from reading your blog posts. My take away today are the ACTIVE LIFE suggestions. 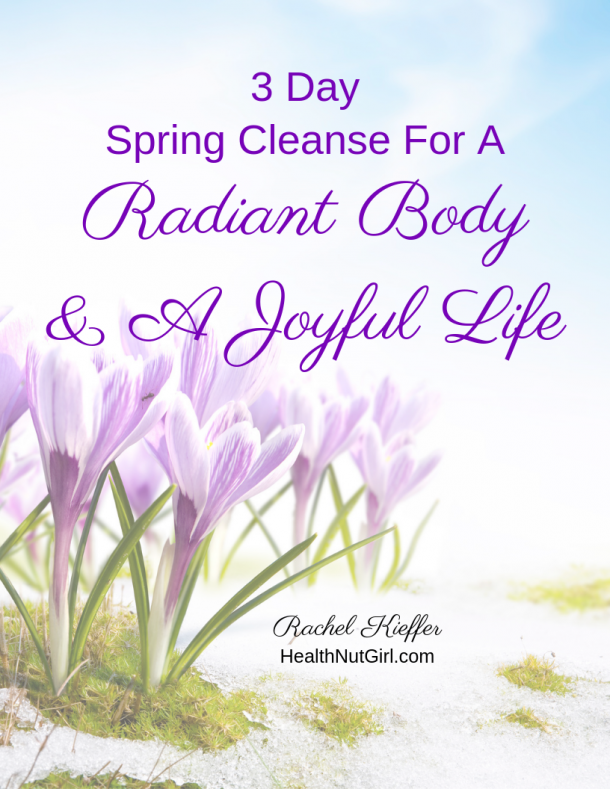 I am starting a three-month countdown to my 65th turn-around-the-sun, with the focus of BODY for MONTH ONE that starts July 14. So these ideas provide me with a checklist. My husband and I have worked hard to create our own blue zone. I do need to re-institute the dance breaks! Studying and embracing the lessons from the Blue Zones over the last few years have had a huge influence on my life. Thanks for the reminders. Excellent article and great advice for a healthy life. I am definitely a Blue Zone kinda gal these days. Walking is the best and I get to do it along the beach. Dancing…you have me thinking of doing more with this type of movement in the very near future!